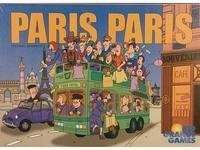 Every year, millions of tourists visit Paris and the many attractions the city has to offer. To the joy of the Parisian business owners � represented by the players � the tourists leave a substantial amount of their vacation money in the Caf�s, Bistros, and Souvenir shops. There are five tour bus operators that offer different routes. The places where the most successful tour buses stop are great places to open businesses that cater to tourists. Then the next time the tour comes by, the owners can reap big rewards for their investments. The player who earns the most money will win the game.